Cut into thin, long trapezoidal shapes and place pieces of these on the model to make a pattern. You do not need to cut any sharp corners or crossings in advance - just place the pieces on the model. Then, use a sharp hobby knife and ON THE MODEL, cut the angles to sharp points. On crossings, decide which line of the pattern is above the other. Cut a mm or so wide gap in the line you decided to be "below" at the crossing and remove the gap. A toothpick helps to remove the bits of mask without damaging the paint underneath. Paint normal colour scheme / shades / highlights. Remove the mask with a toothpick / greenstuff modeling tool works well too. Prepare three strips of adhesive masking film / tape, no need to be thin, but they need to be straight. For each intersection, surround the intersection with the three masking strips so that the white part of the pattern is directly between them. Note that one of the borders where you placed the masking strip must be the one where the line meets the gap. 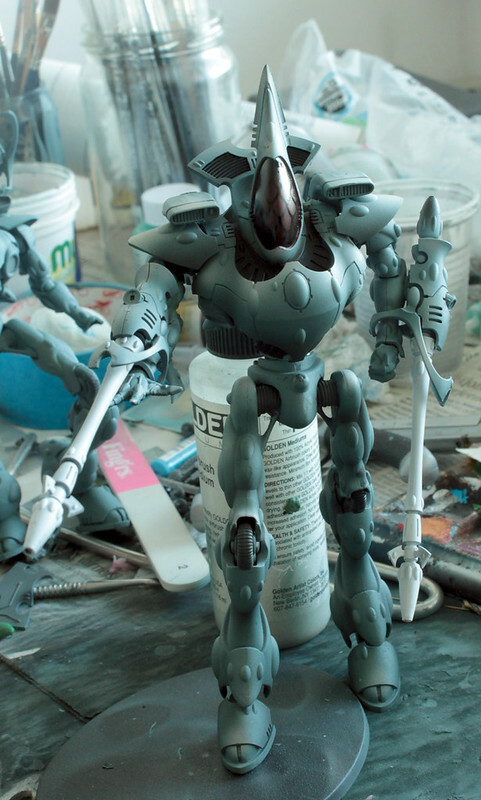 Airbrush a brown colour (VMA Light Camo Brown, ..) shadow from the gap onto the line. 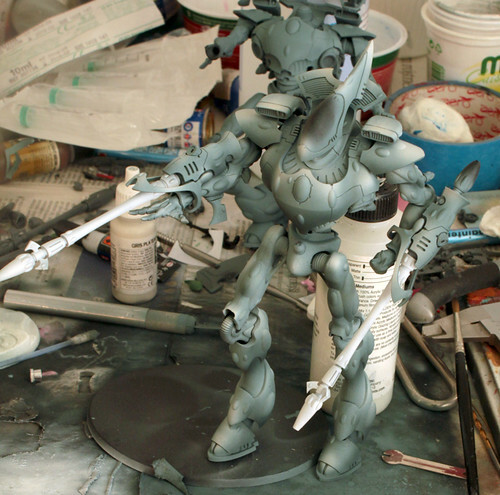 The masking strips you placed will keep the brown from overbrushing to the rest of the model. You can usually do two sides of one crossing by moving only one strip. Super izgleda. Tale maskiranje pa to, vse mi je jasno, ampak rezanje maske na modelu?? Se ne poznajo sledi noža? lenoba wrote: Super izgleda. Tale maskiranje pa to, vse mi je jasno, ampak rezanje maske na modelu?? Se ne poznajo sledi noža? Fantastično pride tole. Super bojan kr tko naprej! Napredek, najbrž vse za danes.. ampak te dni imam veliko časa rezerviranega za barvanje, rad bi imel čimveč narejenega za mariborski turnir. Več barve in zabaven efekt na čeladi. Zdaj bi počasi moralo bit vse nared za gem painting.. ki bo na roke (uh, uh, uh).